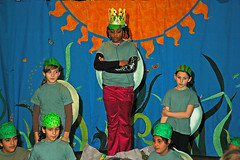 baha’i-inspired theatre: yertle the turtle | doberman pizza. I remember blogging way back about this neat initiative spearheaded by a couple of Baha’is from New York City called the Children’s Theatre Company (CTC). It’s a theatre company that goes far beyond your average elementary school plays and instead promotes theatre as an active way of learning and building character qualities. Ottawa now has a chapter of the CTC, which just ended its first run of Yertle the Turtle, a story about a turtle king whose greed and lust for power get the better of him—to the great detriment of his subjects. One of the children from our children’s class played Yertle, which made us all feel quite proud of her. All the actors were eight- to ten-year-old children from the area; for some, English was only a second (or third) language. All the same, the production was impressive, well presented and funny, and the children seemed to have gained insight into the themes explored in the play, and how said themes apply to their own lives. I was lucky enough to be able to be present during a few of the company’s rehearsals, since they rehearsed at the Bahá’í Centre right after our children’s class finished. Each week, they would learn their lines and then alternate between games one week and character education the next. Apparently the character education part—during which Bahá’í teacher (and excellent storyteller) John Rager would join the kids for a session of discussing moral and character qualities and how they apply in our day-to-day lives and in the world of humanity—was the children’s favourite part. The company presented several times at local elementary schools, and once at the Bahá’í Centre to conclude their well-received run. Children and parents alike eagerly await a new season—which, although there isn’t yet a firm starting date, will hopefully be soon! Photo © Louis Brunet, elbi.smugmug.com. This entry was posted in baha'i blog, by the way... and tagged events, ottawa by danger. Bookmark the permalink. December 10th is the International Day dedicated to Human Rights and this is why I am forwarding you an invitation, to take part of this worldwide activity. As a bahá’í, I think we could leave our mark on that day, showing everyone and with everyone (from all relegious and cultural backgrounds) all that we are all One World, One Life. I know you have your own concerns in this matter, and this is why I want to make people aware of it. I am inviting you to go to http://www.phoenixadaeternum.blogspot.com and see how you could be a member of this network that holds for one cause: the cause of humanity, the cause of Human Rights.